Salam - the infamous greeting of peace. An emotive word so frequently used in Arabic and Turkish, wishing a person to come and go in peace. These earrings remind us of the wings of doves, a symbol of peace and strength in the middle-east. Pure white enclosing a golden heart. Drop Earrings Not Bombs that will make you feel serenely beautiful. Hand coiled and hand shaped brass frame is complemented by intricately laced thread work. 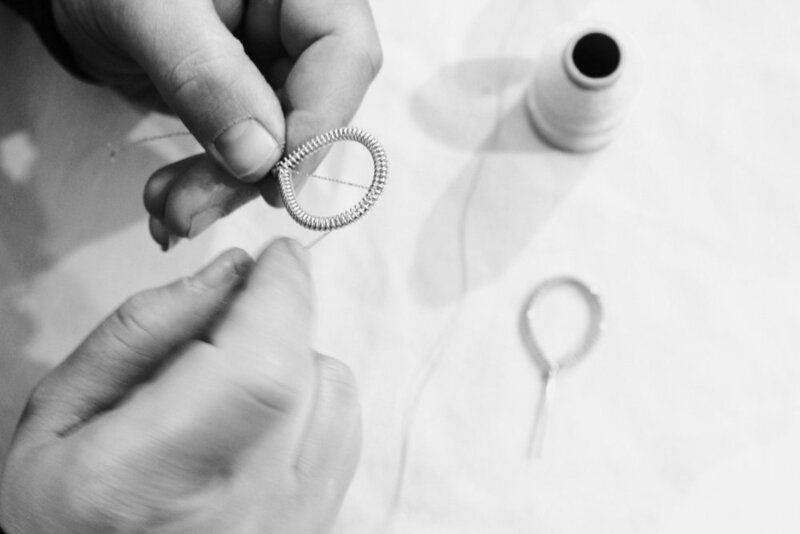 Jewellery that creates not only a fashion statement but also an ethical one. Material: Brass frame, plated with gold or silver. Silver hooks are hypoallergenic , gold hooks are plated and may wear down to the mixed metal. Turkish cotton thread. Drop Earrings Not Bombs is an organisation created to support displaced families, or more accurately Syrian refugees fleeing to Turkey from violence and conflict. As a collection of women, men and families integrating and re-building their lives in Istanbul this initiative provides them not only with security and sustainable incomes, but also community and connectedness through language training and business skill development.